Like a Captured Stone: How did Pluto Settle in its Peculiar Orbit? Published in The Astronomical Journal in 1995. Investigating the history of planet formation in the solar system can be a lot like solving a devious jigsaw puzzle, except that there is more than one set of pieces that will let you arrive at the same final picture in case of the solar system. There is a good deal of debate on the physical mechanism governing the very early stages of formation of gas giants and it continues to be one of the important open questions in planetary science. Today’s paper by Renu Malhotra, next in the series of astrophysical classics, focuses instead on the late stages of planet formation in the solar system when the dynamical interactions between the gas giants and planetesimals are believed to have played a key role in deciding the configuration of the solar system as we see it today. The vestiges of this dynamical evolution that can be observed today are the peculiar orbits (highly eccentric, inclined, and in orbital resonance with Neptune) of trans-Neptunian objects — especially that of Pluto. Pluto is an oddball in terms of its highly eccentric (e=0.25) and inclined (17 degrees to the ecliptic — the plane of the orbit of most of the planets in the solar system) orbit around Sun. Despite this unusual configuration, Pluto’s orbit is remarkably stable due to its 3:2 mean motion resonance with Neptune. This means that for every two orbits that Pluto makes around the Sun, Neptune makes three, which prevents close encounters between them that would otherwise destabilize their orbits. But how could Pluto have settled down in this unusual orbit? Several studies trying to answer this considered the possibility of Pluto being an escaped satellite of Neptune or invoked a catastrophic collision event to explain the origin of its orbit. Malhotra’s model, as described in an earlier work and today’s paper, instead relied upon a more general mechanism of “resonance capture”, which builds upon the insights from one of the earliest numerical simulations of dynamics of gas giants and planetesimals in the outer solar system by Fernandez and Ip (1984). The central tenet of the simple model of dynamical interaction between the four gas giants (Jupiter, Saturn, Uranus, and Neptune) and planetesimals by Fernandez and Ip (1984) is the conservation of angular momentum of bodies in a heliocentric orbit. If a planet scatters a planetesimal in its vicinity from the latter’s initial near-circular orbit, the planet should suffer a change in its angular momentum and hence its orbital radius. From conservation of angular momentum, a planetesimal scattered outward from the sun should cause the planet to lose angular momentum and move inwards, while an inward scattered planetesimal should cause an increase in planet’s angular momentum and hence its orbital radius. A single planet would suffer no net change in its angular momentum, as in that case, it would scatter an equal number of planetesimals inwards and outwards. However, when all four gas giants are taken into account, an asymmetry arises in the final fate of planetesimals scattered inwards and outwards by Neptune. Effectively, the planetesimals scattered inwards by Neptune are preferentially scattered outwards again by the slingshot master Jupiter, and encounter Neptune with a specific angular momentum (angular momentum per unit mass) greater than that of Neptune. Interactions with a swarm of such planetesimals cause an increase in the net angular momentum and the orbital radius of Neptune. In spite of the approximations and limitations of the treatment of dynamics and planetary accretion physics by Fernandez and Ip (1984), an important heuristic insight from their results that intrigued Malhotra was the possibility of outward migration of Neptune. An outward radial migration of Neptune enables the possibility of capture and locking of a small body like Pluto into an orbital resonance! This is shown schematically in Figure 1. Figure 1: This schematic shows the outward radial migration (distance from the Sun increases towards right) of Neptune (N) and its capture of a Pluto-like object (P) into 3:2 or 2:1 resonance. Figure 1 in paper. Taking a cue from the arguments put forward by Fernandez and Ip (1984), Malhotra used a self-consistent numerical gravitational interaction model for the four Jovian planets and planetesimal population integrated over 10 million years (starting from the stage when gas giants had attained most of their masses). Results from her simulations indicate a relatively significant accumulation of planetesimal population in high-eccentricity orbits with 3:2 and 2:1 resonances with Neptune. Focusing further on the orbital evolution of planetesimal population that settle in Pluto-like orbits (3:2 resonance with Neptune) in these simulations reveals a convincing history of the origin of Pluto’s orbit (see Figure 2). The evolution of orbital parameters of a Pluto-like object as predicted by Malhotra’s model shows that resonance sweeping that ensues from outward migration of Neptune can actually pump up the eccentricity and inclination of the orbit of a Pluto-like object to values comparable to those of Pluto today. 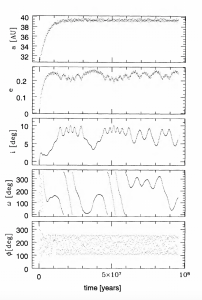 Figure 2: Evolution of orbital parameters of a Pluto-like Kuiper belt object captured in the 3:2 resonance with Neptune, as predicted from Malhotra’s dynamical model. Over long periods of time, there is a transfer of angular momentum from Neptune to the object which maintains the orbital resonance between them. Top panel shows the object’s orbital semimajor axis, which increases (along with that of Neptune) with time. Second and third panel from top show concurrent increase in the eccentricity and inclination of the object, reaching values comparable to that observed for Pluto today. Figure 4 in paper. One of the implications of this study, besides explaining the orbit of Pluto, was another step towards understanding the dynamical structure of the Kuiper belt. Interestingly, Malhotra’s results were published around the time of the discovery of the first Kuiper belt object (which is when the seed for the hullabaloo on Pluto’s planetary status was really sown!). Her work, in addition to providing the most plausible explanation for the origin of Pluto’s unusually eccentric and inclined orbit, brought in light the insights into planetary migration from the work on the dynamical interaction between gas giants and planetesimals by Fernandez and Ip (1984). Together the qualitative results from these two studies have been crucial in molding the subsequent development of solar system evolution models over the last two decades. Nowadays planetary scientists use the observations of Kuiper belt Objects as tracers to study the possibility of unseen planets beyond Neptune. It would be exciting to see what more observations would reveal in future in this context — the outer solar system has seldom failed to surprise us! I am a PhD student at the Anton Pannekoek Institute for Astronomy, University of Amsterdam. I work on characterization of exoplanet atmospheres to understand the diversity and origins of planetary systems. I also enjoy yoga, Lindyhop, and pushing my culinary boundaries every weekend.